SmartAVI'sVDX extends of high definition VGA video signals, as well as RS-232 control signals, up to 1000 feet away from source devices via a single CAT5 twisted pair (UTP) cable. Powerful, Plug-and-Play VGA Extension The VDX system is plug-and-play, meaning users of any technical skill level can easily install and start using it right out of the box. With a vast signal range of 1000 feet between the transmitter (TX) and receiver (RX) units, the VDX excels at HD video extension at resolutions up to 1080p (1920x1080) full HD. Cost-Effective Extension in Any Environment Cost-conscious users will be pleased with the VDX's economic CAT5 cabling, which is popular for its reliability and affordable pricing. Better yet, the VDX is compact and integrates easily into existing AV set-ups. This makes the VDX an ideal fit in airports, retail stores, entertainment venues, schools, hospitals, and other high AV-enhanced facilities. 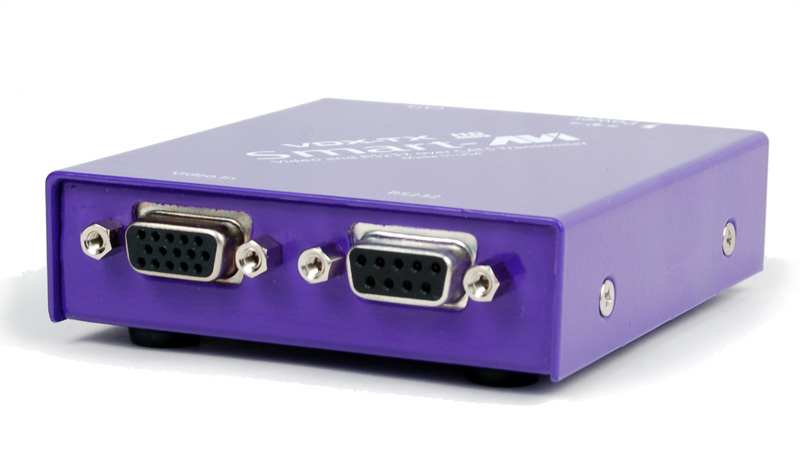 Sends high-resolution XVGA and RS232 signals. Bidirectional serial RS-232 (Tx/Rx) control. Presentations The VDX series enhances any presentation from commercial products to corporate financial data. It can be used in show rooms, board rooms, trade shows, Kiosks and window displays. Data Broadcasting Data such as news, stock prices, sports results, and flight information can be broadcast in real time to various monitors. Learning and Training VDX can be used in educational presentations to multiple locations, in schools and in other training facilities.